This simple crochet throw pillow pattern would look lovely with any decor and would make a great gift! 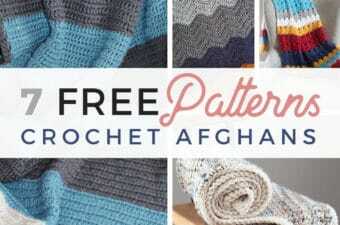 Read on down to find the full, FREE crochet pillow pattern! I’ve always loved decorating my couches and chairs with pillows. You might remember the Crochet Square Pillow design I made from last year too! As much as I loved the old design I decided to create a crochet pillow cover that had buttons because if you’re anything like me keeping them clean (hello pet hair & kids) is always a struggle. This crochet pillow cover is made to match! A few months ago I released the Ombre Ripple Crochet Blanket pattern keeping in my mind, I eventually would love to make a pillow to match. 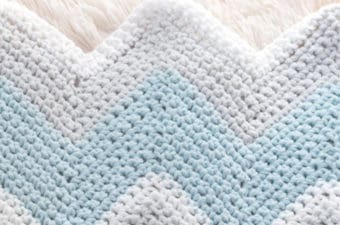 I used the same Lion Brand Vanna’s Choice colors in Linen, Silver Blue, Navy & White so they would go perfectly on my couch with my crochet ripple blanket. 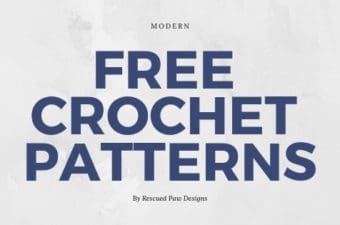 This crochet pillow pattern works up fairly quickly since it’s made up of all single crochets! Yay to fast projects! 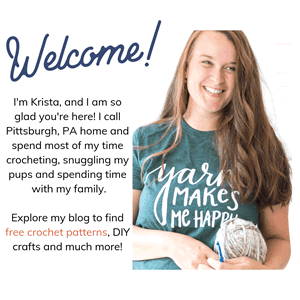 If you are ready to make one of these crochet throw pillows for yourself read on down for the full pillow tutorial with pictures & instructions. It helps to crochet over your ends as you join in new colors, leaving a few inches to fasten and secure with the yarn needle. Find a tutorial “Here” for that technique. Lay out both pieces with the first piece on top of the second making sure the ends that you crocheted over are on the inside (see picture) and make sure they line up. 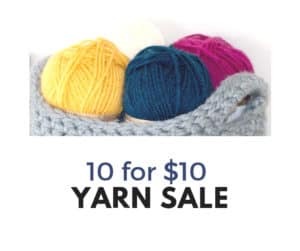 Now weave in the loose ends with a yarn needle and secure. Next, you will sc down the left side of the pieces with white holding them together, starting on Row 48 for a total of 47 sc’s, do 3 sc in the corner, next working along the bottom of the pillow sc across 37 times, do 3 sc in the corner, next working up the right side sc for a total of 47 sc’s, fasten off. Attach the 3 buttons (with a yarn needle and a 5 inch piece of cut yarn) evenly across the front of your pillow along the bottom of the silver blue row closest to the top. The 2nd piece (one on the bottom) will fold over and attach to the buttons. I hope you enjoyed this crochet pillow pattern and as always thank you for stopping by! If you have any questions, please send me an email at [email protected] or find me over on Instagram!